Thank you for stopping by... and if you are here then you must be like the rest of us and you love old stuff. 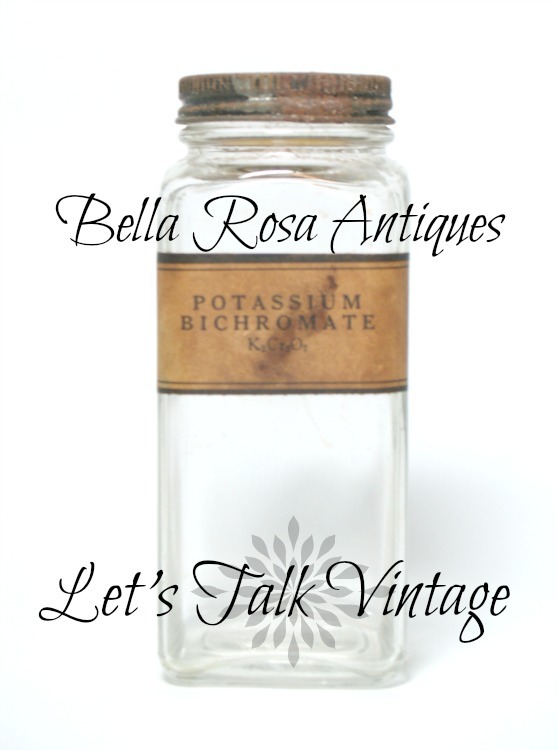 Feel free to link up your vintage finds, collections, family photos and history, vintage inspired projects, and more. Today I'm sharing some of my Vintage and Co. shop updates. And this is where I'll have to brag on my Hubby a little bit. 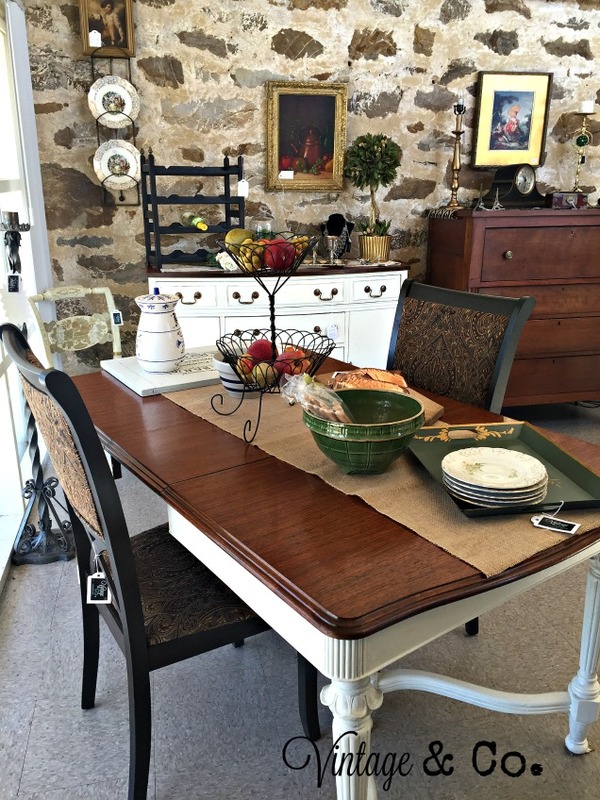 He refinished this vintage dining room table and buffet. Both pieces were from other sets. This table was temporarily sitting in our living room and it was very, very dark with the deep mahogany stain. It was so dark I didn't even notice the petal features on the legs. The buffet is very sturdy and well made. 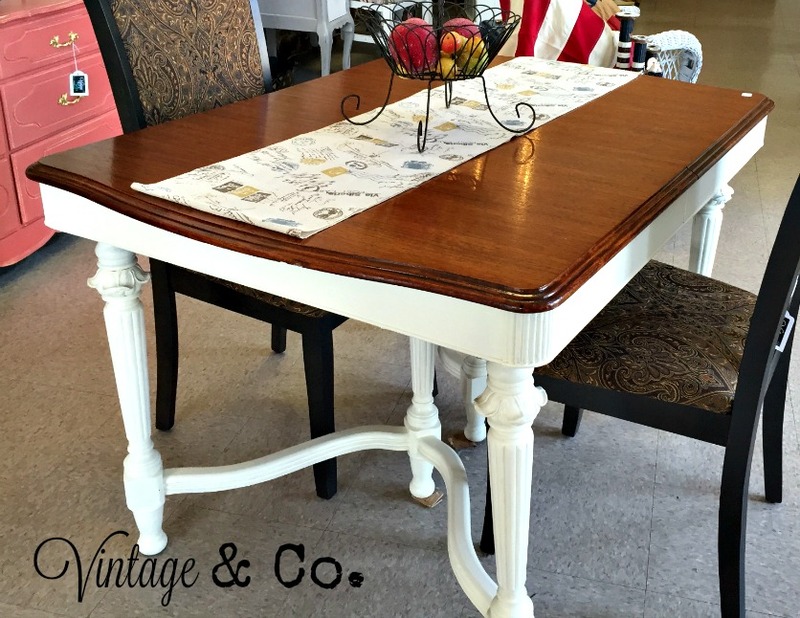 We were contemplating what color to paint it when I realized it would be great to create the same look and have it match the table. Hopefully, someone will by both. We really have great prices compared to new. This silverware chest was not in good shape when I found it. 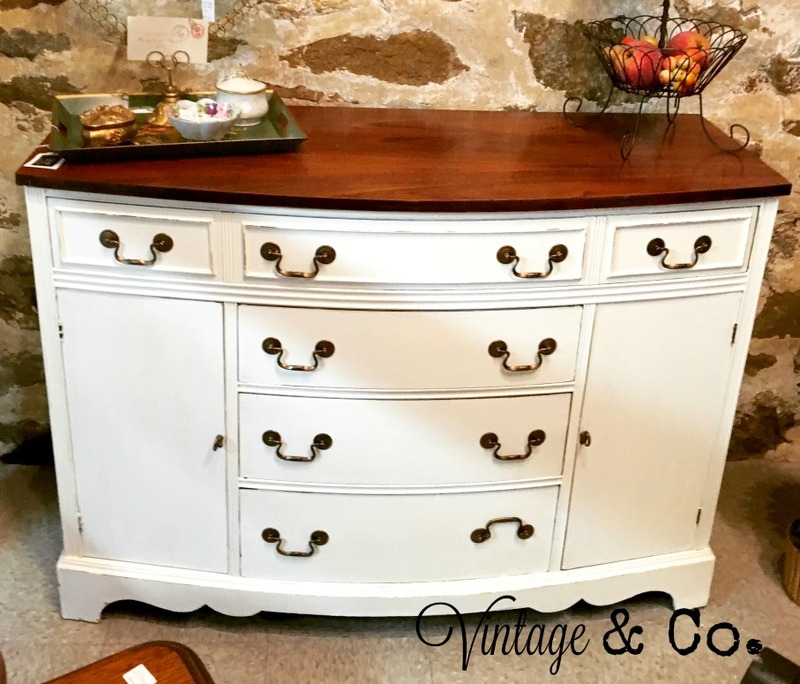 Gave it a coat of Parisian Grey chalk paint, sanded, distressed, stenciled and waxed. Looking much better now! And while I had the grey paint out and the brush was wet, this cute little tool caddy received some TLC as well. Even though she is leaving my shop mate has been getting crafty. 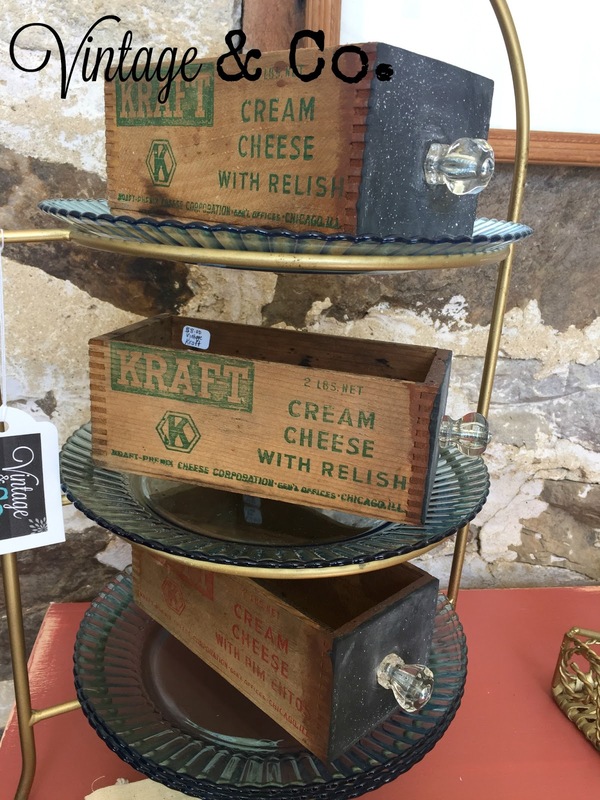 Love these cheese boxes! 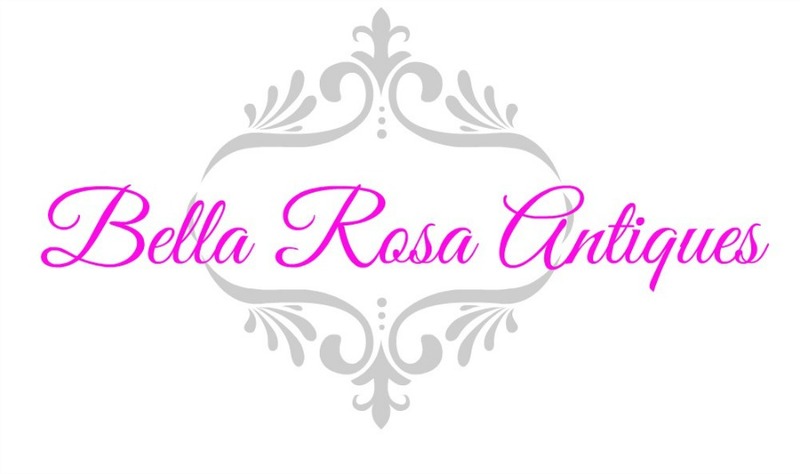 I'll be back with more updates to the shop... big changes are coming and I'm already making plans. 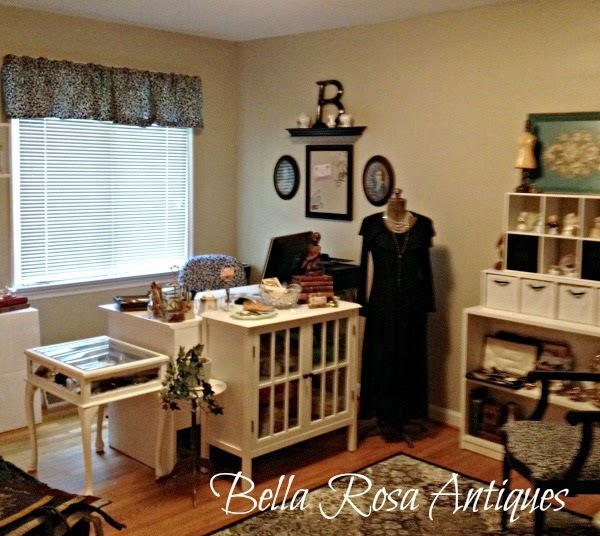 Today the hubby and I are going to purchase and pick up part of a check-out counter from a local scrapbooking store that has just closed. Stay tuned! 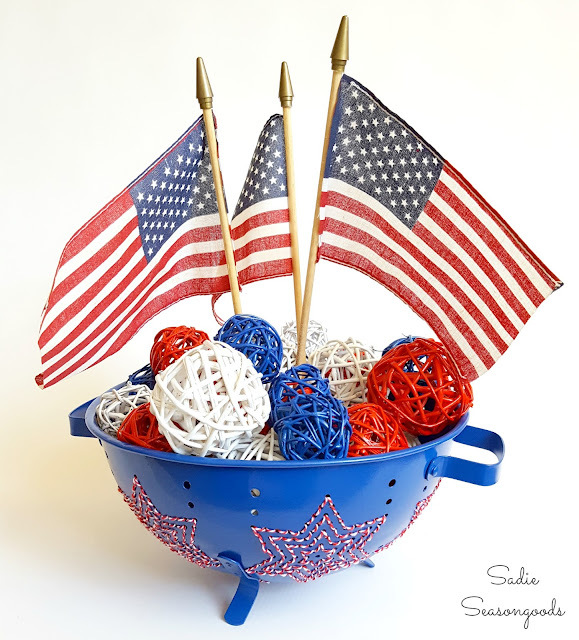 with this star spangled colander centerpiece! And she even embroidered it!!!! and up next is Debbie of Debbie-Dabble. 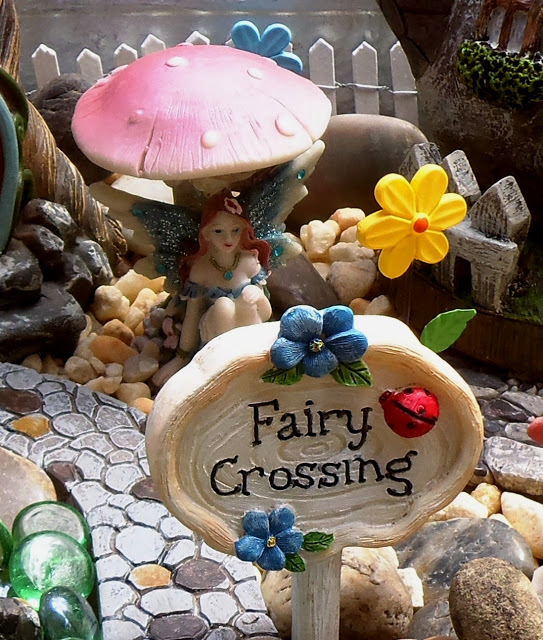 Her fairy garden project is so sweet! Fairy Tales are as old as time! 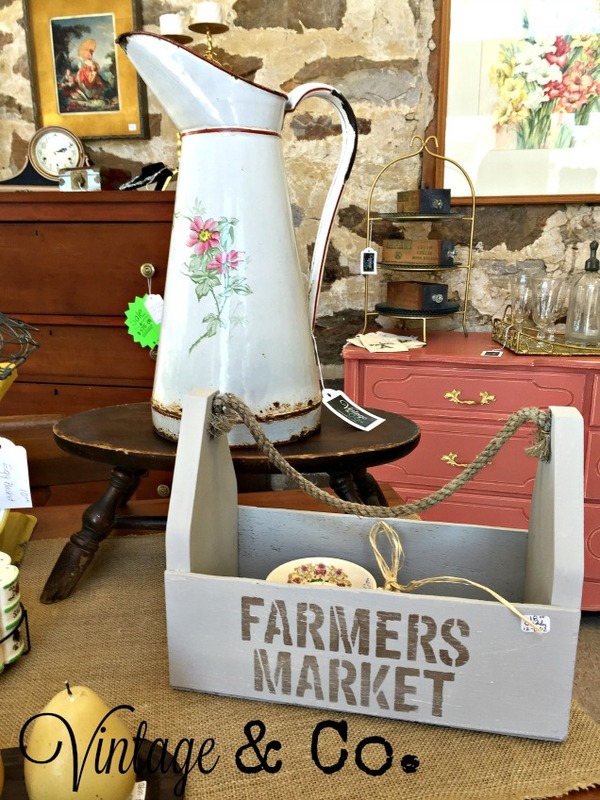 beautiful garden and porch décor. If your post was featured be sure to grab this LTV feature graphic to use in your side bar or in your post. Jill, your furniture redos look amazing, and I probably would've overlooked those wonderful petals too! 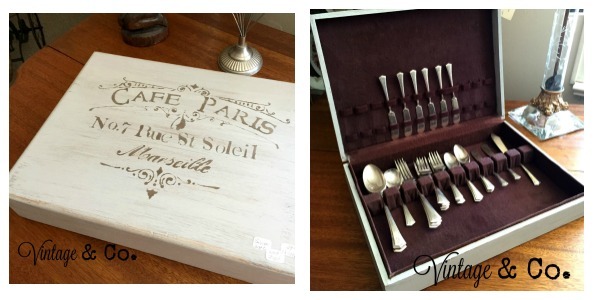 Love the way you reworked the flatware chest too. I hope things are going well in your shop. Thanks for hosting. I thought Sarah's colander project was brilliant! Thanks so much for the feature!! I will be giving you a Shout Out on Google + and in my next post!! I am so honored!! Thanks so much for hosting and again, thanks for the feature!! Jillian thank you so much for showing more of your store - I love seeing everything you are doing, what a wonderful building too. Thank you as well for Let's Talk Vintage 89. Jillian, I love looking at photos of your store. I can't wait to find out the big changes. Tell your hubby that he did an awesome job on the set. Thank you for hosting. Wishing you a great week! 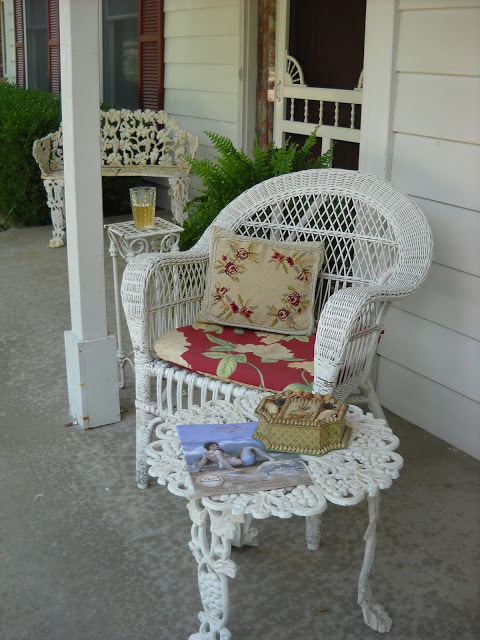 Hi Jillian, What a nice surprise to see my front porch as one of your features, thanks so much! I'll give you a shout out on my next post. Your shop is beautiful. I wish I lived closer so I could go shopping. Jillian, your furniture looks wonderful! Thank you for hosting! Jillian, thanks so much for hosting another lovely party!